The Walt Disney Animated Studios has produced some colorful and timeless tales, each one carrying its own signature. From Snow White and the Seven Dwarfs to The Jungle Book to The Lion King to Frozen, these movies have transcended the animation genre, producing memorable stories of appealing characters, memorable conflicts, and a dazzling array of colorful animation (with almost each one different from the other). In short, the Walt Disney Animated Studio has endured the eras of movies as millions of people (young or old) has experience the joy and love of Disney’s cannon lore of animated movies. With the box success of their last film (2014’s Big Hero 6), the Walt Disney Animated Studio is now ready to debut their next animated feature (#55 in their illustrious catalogue) with the film Zootopia. Does this newest movie stand tall and proud in Disney’s library or is it a cartoon flop? Ever since she was a young bunny, Judy Hopps (Ginnifer Goodwin) has always wanted to be a police officer in Zootopia, a utopian metropolis devoted to the peacefully co-existence of different animals (predator or prey) living in harmonious peace. 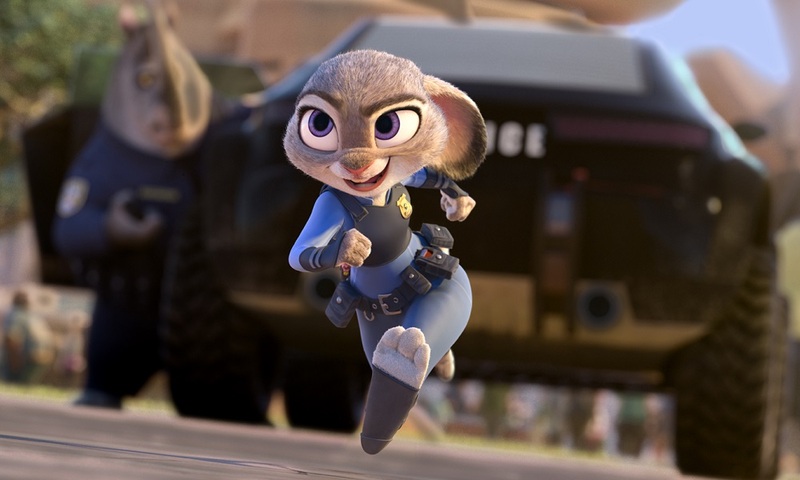 After years of hard work and determination, Judy’s wish comes true, becoming a police officer and journeying to Zootopia. Unfortunately, she’s handed a parking enforcement detail by her superior, Chief Bogo (Idris Elba), who doesn’t think much of the ambitious rabbit’s enthusiasm. Eager to prove her worth, Judy takes a chance on a missing persons case, trying to help Mrs. Otterton (Octavia Spencer) find her lost husband. Judy enlists help from Nick Wilde (Jason Bateman), a sly scam artist Fox who’s the cop’s only lead, with the pair embarking on a mission that takes them across the vastness of Zootopia, unraveling their “missing” persons case as well as learning more about each other in the process. What can I say…. I’m a huge Disney fan Maybe not like my friend over at Reviewing All 54 Disney Animated Films And More!, but the Disney cartoons (in general) have been a big part of my life. Mickey, Minnie, Donald, and goofy literally grew up with me and were a part of my childhood as well as (and even more so) Disney’s animated feature films. I remember always watching Sleeping Beauty, Cinderella, Aladdin, and The Lion King when I was younger and, even though I’m older, still watch them with the same child-like wonder and amazement. Even like some of the more recent movies like Tangled, Frozen, and Big Hero 6. So, in a sense, the Disney animated features are a big deal to me. Thus, after seeing the trailers for the movie, I was instantly curious to see Zootopia (#10 on my Top 15 Most Anticipated Movies of 2016). After viewing the movie, I should of place the movie higher on my list as Zootopia is an instant classic for Disney’s pantheon of animated movies, offering plenty of wit, charm, entertainment, and a very poignant commentary message. The true minds behind Zootopia belong not to just one or two, but three “key” individuals. Originally, Jared Bush scripted the story of Zootopia and was aided by Byron Howard (the director behind Disney’s Tangled) and Rich Moore (the director behind Disney’s Wreck-It-Ralph), who joined the project as co-directors. Interestingly enough, Bush’s initial story was originally supposed to center around the character of Nick Wilde as the film’s main protagonist, but (after some revisions to the story) was switched to a secondary role as character Judy Hopps (originally intended to be the side character) was promoted to the feature’s lead role. What Zootopia ultimately boils down to is classic story plot of a “whodunit” of the “buddy cop” genre. It’s a proven method of storytelling, with the pair of characters been initial different from the get-go and learning values that the other one doesn’t have as the story progresses. Zootopia’s scenario plays out that way, hitting some familiar tones along the way (my only negative criticism about this movie), but, for the most part, keeps it somewhat fresh and charmingly entertaining. At a glance, Zootopia looks like an another run-of-the-mill animated movie with various anthropomorphic animals running around on-screen in a colorful cartoon world. However, further examination into the movie proves that it is not. In a nutshell, Zootopia carries a powerful underlining message within its story, utilized as a “kid friendly” cautionary tale on prejudice social issues. Stereotyping, discrimination, and (even a little xenophobia) are weaved into Zootopia’s main plot and are played throughout the movie. It’s definitely an ambitious move by Disney, playing message in their movie, but, in the end, I personally think it works. Some might argue that it’s a little “forced” or has no business in a kid’s movie, with a mind-set of being presented with heavy-handed social commentary dialogue. However, thanks to Howard, Bush, Moore’s ingenious work, it never diverts down that path and plays out (with kid gloves) as its integrated into the main story rather than simply secondary subplot. Its bold, brilliant, and compelling material to be found in cartoon movie and I completely embrace its ideology and been incorporated into the feature. In short, whether young or old, Zootopia’s story carries a powerful and thematic commentary message that’s highly valued and relative (especially in today’s world). As Judy Hopps says in the movie “Life’s a little bit messy. We all make mistakes. No matter what type of animal you are, change starts with you.”. And I can’t agree more with that statement. Animation-wise, Zootopia looks absolutely gorgeous. I mean that concept of Zootopia is literally brilliant, creating several very distinct districts (Tundratown, Sahara Square, Little Rodentia, etc. ), with each one different from the next and clear representation of the animals that usually dwell there. I think the conceptual layout of it all is pretty cool and very creative. As for the animation. Zootopia is a vibrant world with array of colors and nifty CGI animation, which looks more fluid and life-like than I ever seeing before in CG animated movie. Zootopia’s humor is actually pretty good and is continuously funny, playing jokes and gags that have to do with various traits of animals. I personally found myself laughing out loud at a so many moments, especially the hilarious scene where Nick and Judy go pay a visit to Nick’s friend Flash, who works at the DMV (Department of Mammal Vehicles). Even the movie’s catches fun on utilizing pop-culture references (many in fact), but they are fun (and funny) added inclusion on how they are presented. In addition to that, Zootopia also banks on making some references to other Disney’s films, which are quite funny. Like a lot of animated movies out there, the voice talent behind these cartoon characters are usually a paramount importance, with each vocal talent having to convey a multitude of emotions within a fictitious cartoon character. Zootopia’s voice talents are up for the change and succeed greatly in that endeavor, starting with the film’s two main leads. Ginnifer Goodwin fits perfectly as Judy Hopps with her upbeat attitude and sincere naivety makes her character so endearing. Likewise, Jason Bateman easily slides into the character of Nick Wilde, playing the fast-talking con-man perfectly, but his character has an interesting backstory, shedding some light on some intriguing ideas. In truth, the pair fits together (their back and forth banter is hilarious) and Zootopia highlights their juxtapositions attitudes and personas, making them the true narrative backbone of the movie. The rest of the voice talents are delegated to smaller roles, character that Judy and Nick interact with throughout the movie. This includes Idris Elba as Police Chief Bogo, Nate Torrence as Officer Benjamin Clawhauser, J.K. Simmons as Mayor Lionheart, and Alan Tudyk as Duke Weaselton (you can guess where that name is from), amongst several others. Some get more screen time than others, but they still prove to be effective and bring their characters to life with their on-screen vocal performances. Lastly, Latino pop star Shakira is featured in Zootopia, playing pop star diva named Gazelle (who happens to be a Gazelle as well). Her song “Try Everything” is played at twice in the movie and (I’ll admit) is pretty damn catchy. You’ll definitely have the song stuck in your head after you see the movie. I’ll even admit that I went home and bought the song on iTunes. Disney has done it again with their 55th animated feature Zootopia. This ambitious and colorful 108-minute cartoon movie is another slam dunk for the studio (a surefire instant classic). The animation is crisp and beautiful, the movie’s world is intriguing and imaginative, the voice talents are excellent and humorous, and the film’s social commentary message is heartwarming and palpable. Sure the movie’s plot is a little bit familiar, but the feature’s positives definitely outweigh the negatives. Personally, I absolutely loved Zootopia and can’t for it to come out on DVD / Blu-Ray later this year. Dare I even say, I may even like it more than Frozen or Pixar’s Inside Out (I don’t know…all three are pretty good). Anyway, I highly recommend Zootopia for everyone. Whether you’re young or old or even a Disney fan at heart, this animated movie is must for all to see and watch. I have fingers-crossed for a Zootopia 2. Nice review, I loved this movie as well.